Welcome to the official home of MIT's GradRat! Explore the current ring design features, customize your ring, find purchase information, get details about our upcoming events, and more. Think the GradRat is too bulky? We now also offer a slimmer version — the Signet Ring. Once you know what you like best, go ahead and order your ring on the Balfour website! Your GradRat Ring Committee. Learn more about us here. 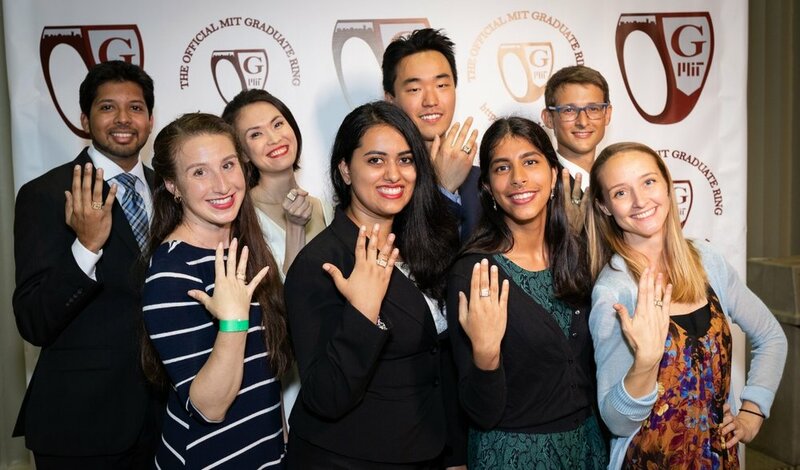 The Massachusetts Institute of Technology Class Ring tradition was born in the spring of 1929 when C. Brigham Allen, the president of the Class of 1929, formed a committee to design a band to be used as the first Standard Technology ring. The committee agreed upon a three-part construction, with a primary image on the bezel of the ring and two other images on the two shanks. Following this, the Class of 1930 was the first to proudly wear what is now known as the “Brass Rat” and what has since become both an Institute tradition and a recognizable symbol of MIT worldwide. As the graduate population at MIT grew and became the majority among both current students and alumni, the Brass Rat tradition was adopted by the graduate student community. Receiving its own unique identity, the “GradRat” was born and quickly grew to be largest graduate ring program in the country. Always staying true to its traditional iconic three-part construction, the GradRat bezel and shanks have been redesigned every five years since 2003 (most recently in 2018) to reflect the unique graduate student culture at MIT. The GradRat is now one the most recognized graduate rings in the world. Now is your chance to take part in the long and unbroken tradition that commemorates our outstanding graduate experience at MIT.